One of my most read blog posts is the of the lost village of Ravenser Odd, a town once situated at the southernmost tip of the Holderness coast in East Yorkshire. Since it has proved most popular I thought I would give you a taste of a couple of the other thirty or so lost villages along that coastline. The story of Owthorne and its church comes to the fore to illustrate the almost surreal events that occasionally happened when the sea claimed the land. Owthorne was a small village just north of Withernsea. In the centre of the village was the church, known as one of the Sister Churches. 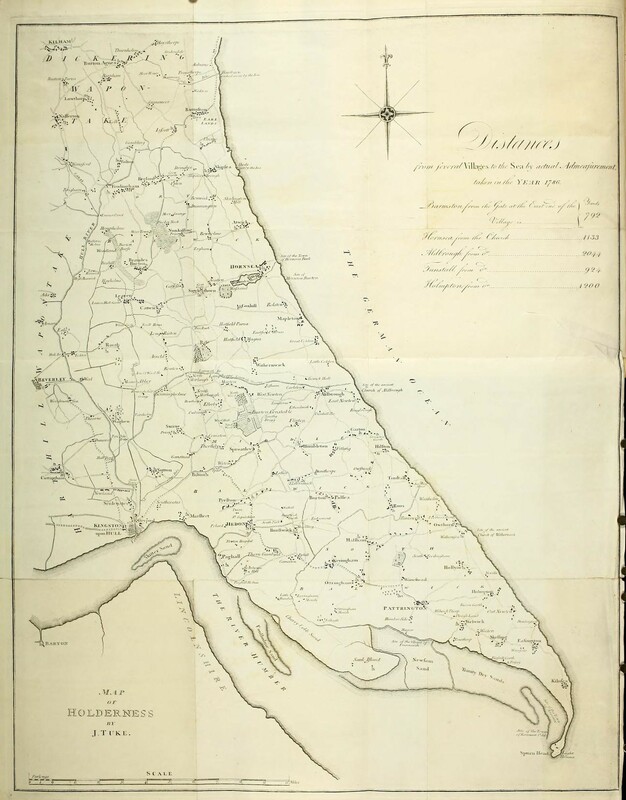 Two sisters owned the manors of Owthorne and Withernsea. Since the two manors ran side by side, they decided to build a church where their tenants could worship. The site of Owthorne Church was agreed upon and building commenced. It was only when the church had reached a certain height that discord between the sisters set in. One wished to adorn the church with a tower and the other to ornament it with a spire. Square or Pointy? That is the question. Finally the sisters decided that they would each build a church – one in Withernsea and one in Owthorne – in the design to which they each aspired. For ever after, the churches were known as the Sister Churches but no spire ever graced either church. ‘standing like a solitary beacon on the verge of the cliff’. By 1786 the church itself was only 12 yards from the cliff and the sea began its work on the churchyard. The villagers and their vicar made plans. In 1793 the chancel was demolished and six years later the rest of the church was partially demolished. It was not until a particularly violent storm in the early years of the 19th century that the remains fell with a crash into the sea. Whitened bones and coffins landed on the beach and, it is said, that the villagers meandered sorrowfully among these relics, even recognising some of their erstwhile buddies although quite how one recognises a skeleton is a trifle difficult to imagine. It took 15 days of grisly work to collect up the relics, hopefully matching owners and bones correctly, before taking them for reburial to a new churchyard at Rimswell. In 50 years the villagers of Owthorne saw the church and churchyard, vicarage, houses and streets disappear over the cliffs until almost nothing of their village remained. The second church in Withernsea fell into ruins by the late 19th century and was replaced by the parish church of St Nicholas. Further down the coast was once the village of Old Kilnsea – called Chilnesse in the Domesday Book. At that time it was several miles inland and established on a hill. Houses and cottages with gardens were clustered around the Medieval church; there was a village pond and green as well as numerous small fields. On the village green stood a large stone cross which was originally taken from the ancient and lost town of Ravenser where it had been erected to commemorate the landing of Henry VI in 1399. 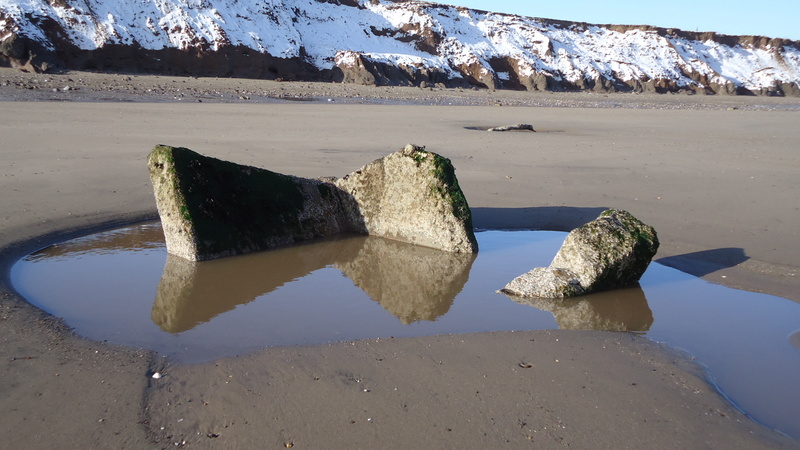 It was removed to Old Kilnsea when the sea swallowed up Ravenser. Eventually though, the sea worked its mischief in Old Kilnsea and the cross was removed altogether to safer ground. By the early 19th century the village was under attack. In 1822 it comprised the church and around 30 houses. 30 years later only a handful of houses and the foundations of the church remained; by 1912 all had gone. In 1824 the chancel went over the cliff and a couple of years later a huge storm took the north wall, pillars, arches, pulpit, reading desk and books right over the cliff ‘with a tremendous crash’. The tower held out for another couple of years before finally following the rest of the church into the sea. The church bell was suspended from a beam in a stack yard and struck by throwing stones at it to call the faithful to their improvised place of worship. 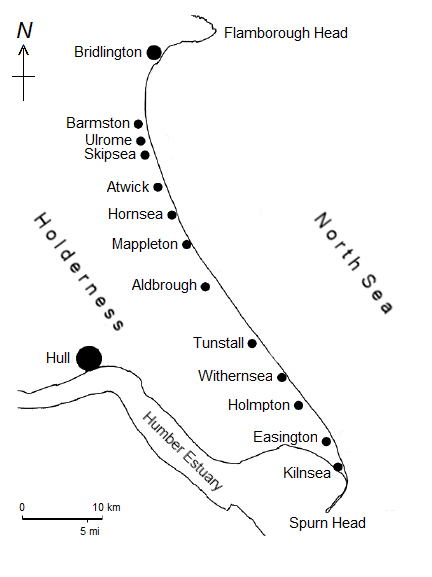 Eventually Kilnsea was resettled to the west. During the First World War a small fort and gun battery was established at ‘new’ Kilnsea but these too have gone the way of the old village. The resettled village is still being chased further inland by the sea. Do you know what it is yet? Does this help? These are photos of Gainsthorpe deserted village in Lincolnshire – one of the best preserved in the realm of deserted mediaeval villages in England. The village is noted in the Domesday Book; later, in 1208 a windmill and a chapel were recorded but the last mention of its name was 1383. 17th century records refer to well- preserved earthworks with a couple of hundred houses and up to half a dozen streets. It was an irregularly planned village, much of which has now been lost to farming and quarrying, but once was a thriving medieval settlement of small houses – one or two-roomed – built of stone. Each house was separated from its neighbour by a low bank with plots at the front – ‘tofts’ – which would have had buildings or workshops. At the back of each house was a ‘croft’ – a garden for growing vegetables and fodder. Streets ran between the houses and field strips for growing crops surrounded the whole village. Over time the village changed as villages do and there are indications of the merger of some of the houses into larger ones which surround a courtyard. The experts believe this to indicate a shift in farming practices and the development of a manorial complex with a home farm complete with fishpond and dovecotes. Today the streets look like deep tracks behind which are the remains of the houses, indicated by their low turf foundations. The field strips have been lost to later ploughing. Other villages nearby suffered from the outbreak of the Black Death – the plague that ran amok in England in the 1340’s. Perhaps that contributed to the village’s demise. Deliberate depopulation is also a possibility when landowners forced out their tenants and used the land for the more lucrative sheep farming. I fancy he is correct. Tomorrow the Kindle version of my history/travel book becomes available on Amazon. The Paperback is already out and some lovely people have bought it – more than I anticipated since I don’t really get into the marketing swing until 10 August when I’m back in the UK. I thought I’d share some of the marketing ideas that I’ve put together and the responses I’ve had to them -bear in mind that this is a non-fiction book and likely to have a limited audience. 1. I’ve had A5 posters made of the cover. I spent ages agonising over the size of these – naturally I thought the bigger the better. However, the posters are going to library, museum, visitor centre and supermarket notice boards in the towns and villages down the coast that feature in the book. The decision about size was taken on the basis that there is always pressure for space and it’s far easier to remove a large poster to make more space. 2. I’ve been fortunate enough to have articles published in a number of regional magazines and I approached the editors to see whether they would review the book. As all have agreed to do so a copy is winging its way to each of them. 3. I’ve used social media to a limited extent mainly because I don’t want to put folk into a catatonic state as I rabbit on. Creative1 publishing – the company that formatted the e-book has offered to do a number of tweets about it for me and of course I use this blog, Facebook and Twitter. In addition I’ve uploaded a number of the photos from the book as well as some that didn’t make it to Pinterest – www.pinterest.com/sheila0661/close-to-the-edge and I’ll be adding to the Board over the next few weeks. 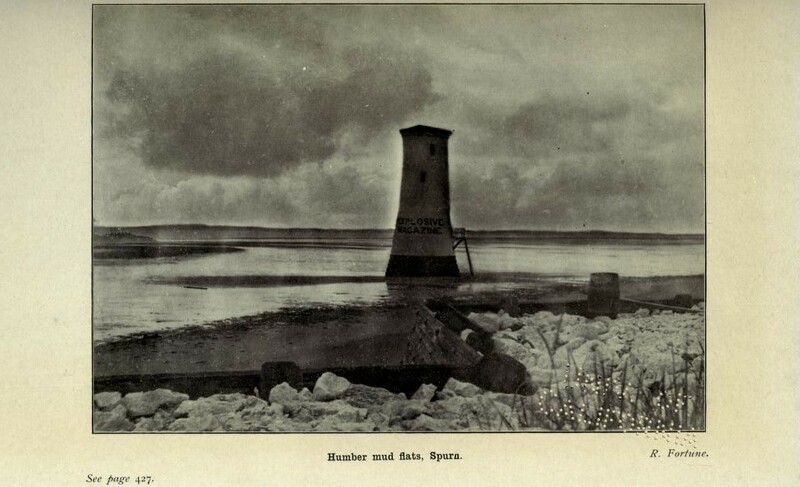 First Spurn Lighthouse later used for storing explosives. 4. I’ve approached the local radio station to see whether they would be interested in running a short piece as well. So far, the air waves are silent. 5. I now regularly follow some of the local newspapers to pick up any snippets of news relating to the area I’ve written about. This enables me to contribute to any debate or news item on-line without overtly touting the book. I find, like many independent publishers/authors, that marketing is just not my thing. I shrink from banging on too much about The Book and don’t find it easy to “naturally” mention it in both on-line and direct conversations. When I’m back in the UK I’m going to a couple of independent bookshops in the area to see whether they would take the book on and that fills me with some trepidation too…and I’m not normally what you might describe as a shrinking violet. I can’t quite put my finger on why this is just yet so I’ve tried to adopt the attitude – “if you don’t ask – you’ll never get”. I also keep asking myself – “What’s the worst that could happen?” and have (perversely) rather pleasurable moments thinking up the most horrifying answers. It helps to soothe the fears. So this is where I’m at right now. Saturday 1 August is E-Day for “Close to the Edge – Tales from the Holderness Coast” – it’s also Yorkshire Day so it seems fitting. Breath is baited! In the meantime if any of you kind souls are interested in an eclectic and occasionally irreverent history of a unique stretch of English coastline, toddle along to Amazon and have a peek. Here’s the link (I hope) and all reviews of whatever ilk will be much appreciated. Almost where? I hear you ask. 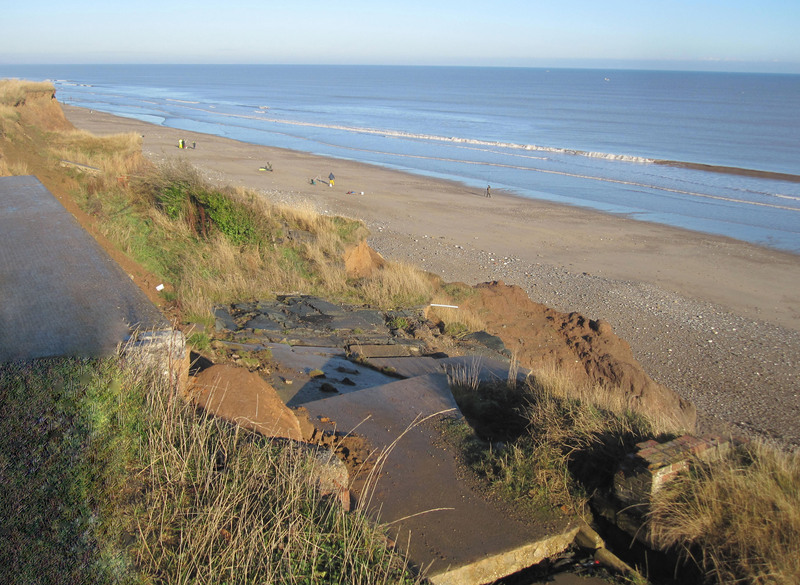 Answer – ready to upload “Close to the Edge – Tales from the Holderness Coast” which, at the risk of driving you into mild catalepsy is my local history book about the East Coast of Yorkshire. The book has taken around 18 months of research, writing and faffing, including an abortive sojourn at a publishing house (for which, if I’m honest I still bear a grudge). On reflection a good lump of that time was taken up with editing, copy reading, obtaining permissions/rights and I still worry that someone will find a typo. On doing yet another re-read last night it was good to remember how many people and organisations have indirectly contributed – not in the least local museums and libraries. I know these invaluable institutions are under threat from “austerity measures” in the UK so I wanted to use this space to give a shout to some of them and urge anyone looking to spend a bit of time on this eroding coastline to go and visit. 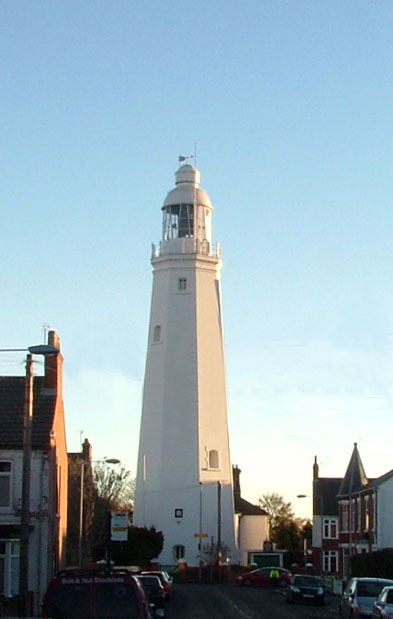 Withernsea Lighthouse Museum – situated – yes you’ve guessed it in Withernsea. It stands, a little incongruously in the middle of the town and has some interesting coastguard and RNLI displays and selections of old photographs relating to local history. 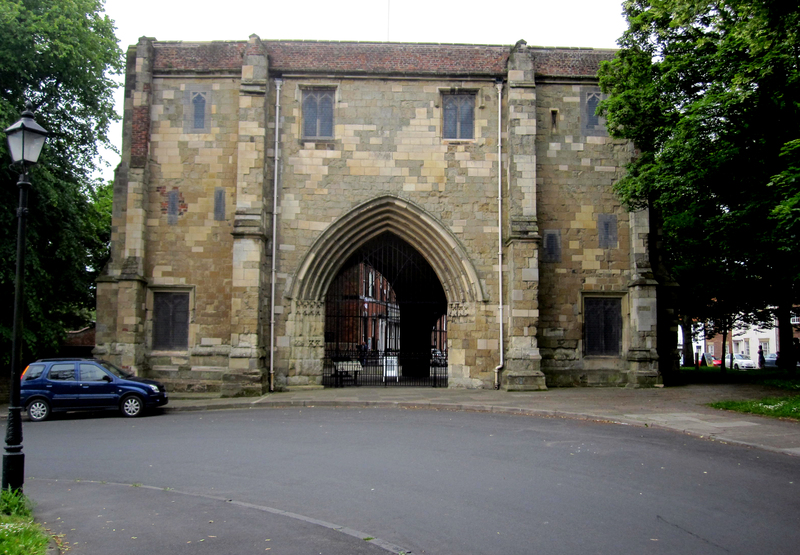 The Bayle Museum in Bridlington is located in the old gateway to Bridlington Priory, itself a victim of his royal humpingness, Henry VIII. It is dedicated to the history of the town of Bridlington. All three museums give a great flavour of times past on the coast and are open now, for the season. Check websites for details. In addition to the museums I made shameless use of three libraries when researching “Close to the Edge” – these were Hornsea, Bridlington and Beverley libraries. Since libraries seem to be becoming endangered species I’d just like to say that without their helpful staff and the ability to plunder their resources I wouldn’t have been able to write “Close to the Edge.” Thank you one and all. 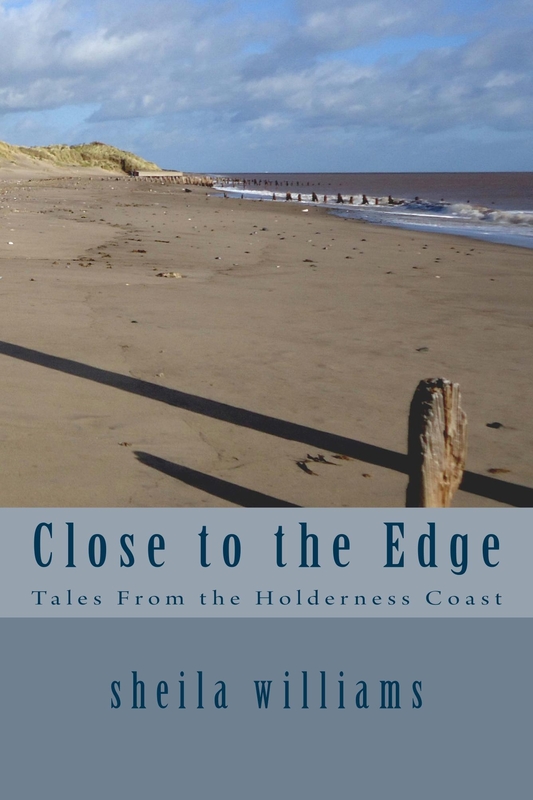 Close to the Edge – Tales from the Holderness Coast is scheduled for publication as an e-book on 1 June and will be available from Amazon – that is gremlins permitting. Today I thought I’d let you have a look at some of the photos used in my forthcoming book – Close to the Edge – Tales from the Holderness Coast. 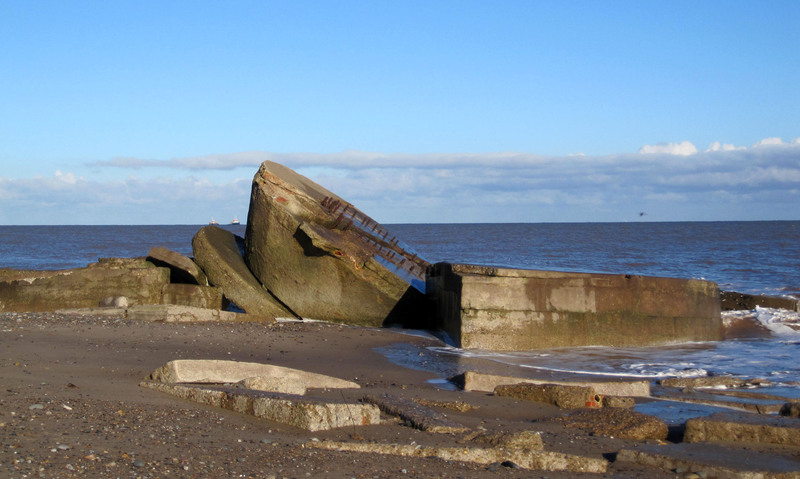 For those of you who don’t know the area (or even the country – UK that is) the Holderness Coast is a strip of East Yorkshire coastline that has both a remarkable past and an uncertain future. The problem is coastal erosion which has seen more than 30 villages and settlements disappear or “gone back to the sea” and the erosion continues today. Close to the Edge is an eclectic and sometimes irreverent collection of tales about people, places and events along the coastline. Have a peek at some of the photos taken by my co-conspirator in this enterprise – June Berridge. Close to the Edge? Close to Meltdown! Long time no write! Since my last post I’ve been eagerly awaiting a verdict from the publisher about my book Close to the Edge. Finally, after getting all excited and talking turkey with the publisher, I get it kicked back with a comment that as they’re going to publish another book about East Yorkshire, they don’t want to take on a second one until sales figures are in. Did it really have to take eight weeks for them to tell me this? So after a week sticking pins in my voodoo doll, I’ve recovered my equilibrium and am on the move with the first version of the book – a Kindle version. The book has a great selection of images both old and new (you’ll probably have to magnify this one to see it clearly) and I’ve learned that copyright is a minefield even for items that are over the prescribed time limits. I’ve spent so much time trying to track down owners, owners relatives, owners best friends and owners dog called Poochie that I’m beginning to think it isn’t worth the candle to include anything other than my own images. Still, ’tis done now as best I could. I’ll by posting some of the images that didn’t make it into the book over on Pinterest – look for the Board called Close to the Edgeand over the next few weeks I’ll add to it. I’m also going to be making a few short clips for youtube so watch out for those as well. So lots of final details to deal with whilst at the same time, I’m pressing on with a selection of spooky short stories – four written and three to go…oh and of course celebrating the anniversary of my first year in France (any excuse for a party). Suffice it to say I came, I saw and was conquered. It’s definitely home now.